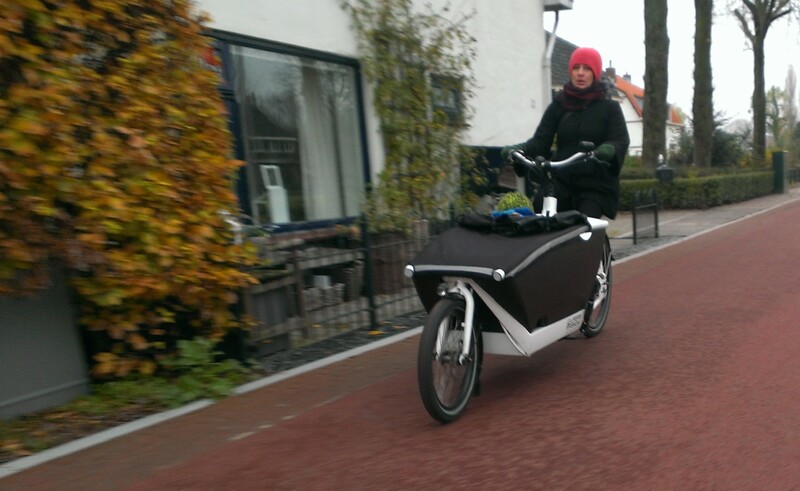 It’s awesome owning a bike I totally love: Since September 2014 I’ve been pedalling an Urban Arrow equipped with a bosch middle-engine. It has a spacious cargo area, a padded seat for children and a spring suspended mounting for a baby car seat. This bike has made everyday riding fun and totally practical; with no hill to high to climb. Not to mention the joy of shopping: I can go grocery-shopping without thinking about having enough room on my bike or too heavy a load to carry. In fact, I usually consider offering grocery delivery service to others while I am packing my bike. I sometimes see people loading their bikes with bags hanging from their handlebars and little baskets purging with vegetables. I was there once. And it sucked! I used to stuff my backpack so much that the zipper finally busted and hanging grocery bags on the handlebars resulted in ruined bags and runnaway onions. This bike rocks! Sven and I call it the whale because of its size and colors, but also because it is a solid swimmer: it swims despite the waves. I admit, this bike is somewhat girly and not as fast as my roadbike, but most importantly I feel confident carrying my favourite cargo: kids! Over all it’s an ocean out there and I love riding the waves with this aquatic beast, the whale. Previous Previous post: it is not your groceries, it is YOU!